We are doing well, getting used to our new routine of getting up by 6:15 AM and out the door by 7:30 for Mark's 8 AM radiology appointment. 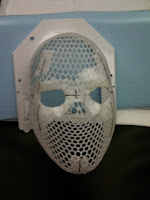 Mark has to put on a tight-fitting mesh mask which was made to fit his face, and the mask gets bolted down to the table he lies on, in order to keep his head perfectly still and to show the technicians exactly where on the mask to aim the x-ray beam. It's a little creepy, but the treatment just takes a few minutes. I was glad to go back into the treatment room with Mark one day to see the setup and ask some questions, and yesterday we met with the doctor and got some further assurances about their quality control procedures (especially on our mind after the recent articles in the NY Times). Mark has had some headaches/achey eyes, but is mostly feeling fine. 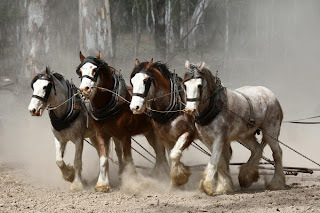 It's somewhat dispiriting to have 4 weeks of these treatments stretching ahead, but we are enjoying thinking about a weekend get-away trip or two - perhaps to Skamania Lodge and/or a train trip to Seattle. We've also decided to hit as many eastside coffee shops as possible after the 8 AM treatments, whenever Mark doesn't have a 9 AM meeting to get to at work. (Yes, he's still working practically full time.) We'll see how many good coffee spots we can find and how many scones we can eat within a 5 mile radius of the radiation location (Kaiser on NE Interstate). So far we've been to the Bakery Bar (the one on SE Water Ave. and the one on NE Glisan) and the Blend Coffee Lounge on NE Killingsworth. Suggestions are welcome! Mark and I saw Dr. Johnson this morning, a radiation oncologist. We agreed that Mark will begin four weeks of daily radiation treatments to the eyes next week, to ensure that there is no active lymphoma present before the bone marrow transplant. Mark had a mask fitted to his face, which will allow the radiation to enter only the eye area. ( I wondered if we could attach some good-luck charms and feathers to the mask...) The radiation (or high energy x-rays) will be directed at the eyes from each side, targeted to the vitreous fluid in the eye, behind the lens of the eye. No damage to the retina or the vision is expected at the low doses of radiation that will be used, which is a big relief! There is increased risk of developing cataracts in the future as a result of this treatment, but that's not a big deal and can be easily treated. Mark has an appointment next Tuesday to fine-tune the positioning of the radiation treatment, and then starts daily treatments on Wednesday, which will only take a few minutes each visit. We requested an 8 AM daily appointment time, which will allow me to drive Mark there and then drop him off at work afterwards. Mark has a message in to Dr. Maziarz to see if we can move ahead in February to schedule any of the tests or education sessions required before the transplant, which will be delayed now until March. He continues to feel very good and energetic! So this is me at Kaiser Sunnyside for my "FIRST" go around with chemo-therapy. This was back in the fall of 2008 (is that right?). I was treated at this facility for non-hodgkins lymphoma using a comprehensive chemo-therapy regimen. This was effective and I weathered the treatment pretty well (memory is so subjective isn't it?). The facility and people at Sunnyside are terrific - I can't say enough about the amazing nursing and other staff there. I gained complete remission and enjoyed getting my life and my strength back. Julie and I enjoyed a wonderful trip to France to celebrate, and I was happy to have that chapter behind me. Then this last summer I began to notice a disturbing degeneration in my eyesight - mostly in the form of "floaters" that wouldn't go away. I visited an Optometrist, who recommended I see an Ophthalmologist right away. Soon I was biopsied (a surgical process that removes the vitreous fluid in the eye) and diagnosed with lymphoma again - the same variety as before. So I had relapsed. Treatment this time around included rounds of high dosage Methatrexate in the hospital, 4 rounds, as well as injections of the chemo in my eyes (yucky, but some how not as bad as you might imagine to be). Ultimately, the treatment I'm facing at this time is to do a full Bone Marrow Transplant (BMT) up at Oregon Health Sciences University (OHSU). Mark finally got an email today from Dr. Rarick, saying that the consensus from the lymphoma board was for Mark to have radiation therapy to the eye and then go forward with the transplant. Mark now has an appointment for Friday, Jan. 22 at 7:30 AM for a consultation with the radiologist - a new doctor, Dr. Johnson. That will be a 90 minute appointment, probably followed by a CT scan. We have no idea how long the radiation treatments would continue, or what the schedule would be for the BMT (bone marrow transplant). We'll keep you posted, as we learn more. Just one more hurdle on this obstacle course we are on! This is a wonderful essay by one of my favorite authors, Stephen Jay Gould. It is inspiring message, and especially important to keep in mind when navigating the seas of statistics.